During Japan’s 12th Century, a woodcutter and a priest relate conflicting stores to a third man as the group takes shelter under Rashomon gate. The different tales revolve around a bandit, Tajomaru, who has attacked a couple wandering through the woods, tying the husband up and forcing himself on the wife. The husband was found dead in the forest by the woodcutter, but what actually happened between these people is inconclusive. Tajomaru, the wife, the husband (through a medium), and the woodcutter all present different and irreconcilable versions of the events in question to the authorities. The woodcutter and priest are disturbed by the absence of an objective truth, but the third man seems not to care. The three find an abandoned baby under the gate, and the third man steals some of the items left with the child and leaves. The priest fears for the baby’s safety, but the woodcutter states he already has several children and offers to care for this one as well. Akira Kurosawa’s Rashomon was the first Japanese film to achieve widespread, international success and opened the gate for Japanese cinema’s prominent entrance into world cinema. Kurosawa became the best known Japanese filmmaker throughout the globe, particularly in the U.S. whose cinema was a direct influence on his work. Of course, American film has collected on this debt by remaking many of his most popular works, often in the Western genre. Kurosawa himself was able to work semi-regularly up until a few years before his death in 1998, his style continuously evolving to include a more contemplative, slowly-paced rhythm. 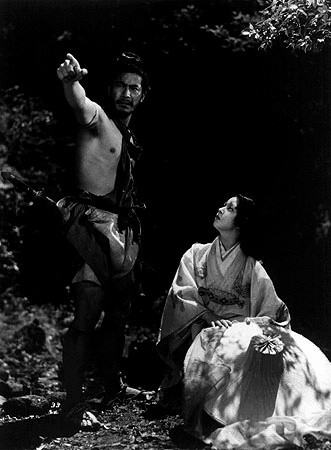 Rashomon, however, is a relatively early work and contains the rapid, kinetic editing that is often associated with its director. It is also a brilliant visual experience with carefully composed shots, frequently impressive camera movement, and a broad range of grays in its black and white photography, accomplished by Kayuo Miyagawa. But probably the most striking aspect of the film is its thematic focus on the complex and unstable nature of truth. Before delving into these ideas, the film sets up its structure and shows off some of its stylistic brilliance that will be spread throughout. The present-time section of the plot occurs at a gate under which the characters take shelter from the rain. The crumbling, rotted structure of the gate suggests the decay of people's trust in each other or even the dying notion of an absolute truth. The woodcutter repeatedly proclaims his misunderstanding, the priest says that what has occurred is worse than anything else, and the third man merely seems interested in a good story, as long as it’s not a "sermon". This scene manages to arouse interest in what could be so incomprehensible and also so fearful. As the woodcutter begins his initial story, the film turns his journey through the forest into a tour de force of camera movement. There are several aesthetically pleasing tracking shots that look up at the canopy of tree branches, some directly pointed at the sun whose light sprinkles through in varying amounts. Some tracking shots seem to be taken from up in the tree limbs and glide through them smoothly while showing the travelling woodcutter from above. Unusual tilting shots and low-angle panning further explore the natural surroundings while situating the woodcutter among them in a visually arresting manner. The pounding, rhythmic music adds to the effectiveness of the scene, at least until it becomes overly illustrative of what goes on within the frame. A memorable composition shows the locked arms of the dead body in the foreground while placing the woodcutter between them in the background of the shot. The camera somehow rapidly tracks through the thick forest with the running woodcutter and gradually cuts in tighter on his frightened expression. After the woodcutter supplies his information to the unseen officials, the priest says he also saw the couple and is shown to be a caring, thoughtful person—he comments, "life is delicate, like the fleeting morning dew". Contrasting him is the coarse rogue who shows up at the gate to listen to these stories; he tends to embrace and even celebrate the pessimistic, negative view of man that the priest resists. For transition between the various accounts told in flashback, Kurosawa employs one of his favorite techniques that is rarely used by other filmmakers: the wipe. Tajomaru the bandit, played excellently by frequent Kurosawa actor Toshiro Mifune, gets his story related first chronologically. The first glimpse of him shows his detached viewing of a group of clouds—a poetic shot that may also indicate his indifference as to what will happen to him. As he describes his triumphant riding of the stolen horse, there is an almost absurdly lyrical extreme long shot of him riding under an expansive sky. This shot may give the first clue that ego and self-perception will be affecting whatever accounts are given. Mifune interprets Tajomaru as a beastly sort of fellow with his stalking movement and with the way he’s always swatting insects on his body or rubbing his knee; consider the way he slinks around the couple, observing his prey for a long time before speaking. Another shot that throws into question the objectivity of what the viewer is witnessing involves the woman waiting in a clearing of the forest while her husband and the bandit are away. Since this is the bandit’s story and he is not there, how can one be sure of what is being shown? When the bandit finally confronts the woman with her bound husband, an interesting sequence follows that groups every possible pairing of the three from different viewpoints, suggesting the problematic ‘love triangle’ that will be developed. Furthermore, sprinkled throughout the stories are shots of two of these characters interacting in the foreground with the third one in the background or between them. The sword fight in Tajomaru’s version shows he and the husband fighting bravely, and the bandit seems to display an extraordinary amount of confidence that is, nevertheless, not questioned at this time. When the woman begins telling her recollection of the events in question it starts to become clear that arriving at the truth may be difficult or impossible. Machiko Kyo superbly embodies the different incantations of the attacked woman. In her version she speaks about how sorry she was for her husband and how she tried to comfort him. Although Tajomaru is shown only briefly, he seems slightly more childish and cruel, again suggesting the differences between self-perception and the perception of others. A lighting technique that is especially prevalent in this section is shadowing the characters’ faces with the dapple light filtering through the trees. This counts towards realism but may also suggest the film’s theme that the facts cannot be seen in black-and-white absolutes but rather should be viewed in more problematic, gray uncertainties where truth and fiction are side by side. The woman recalls how her husband’s eyes showed a cold hatred, perhaps reflecting an irrational guilt she feels, which might explain why she claims to have inadvertently killed him. Or, more simply, the husband's perceived attitude could show her (understandable) acceptance of the role of victim; when speaking about trying to kill herself, she adds, "What should a poor helpless woman like me do?" Her suffering is also emphasized by frequent close-ups and long takes of the woman’s anguished telling of her husband to stop his cold staring. The husband’s version, memorably told through the medium, contrastingly posits him to be the real victim of the tragedy and the woman to be a beautiful, ruthless villain. The bandit almost becomes an ally in this story when Tajomaru turns against the woman after she asks him to kill her husband. The style of this segment reflects the husband’s loneliness and powerlessness by placing him in-depth at the back of the frame as he can do nothing but wait in his bound state. The long takes of the surrounding trees and grass further this viewpoint. The husband eventually starts to cry and then stabs himself with the valuable dagger in the brightly-lit clearing. This moving scene is completed by the medium as she mimics his action and slowly falls to the ground. The film presents the medium’s retelling in such a way so that is cannot be easily dismissed as fraudulent. She speaks with a strange, otherworldly voice as eerie music plays, and a strong wind whips her hair and clothing around furiously but doesn’t even reach the spectators in the background. The husband’s story concludes with a description of how the dagger was later removed from his body. As the medium relates this in the foreground, the woodcutter sits prominently in the background, suggesting that he may be the one who took it. The final story told is the woodcutter’s, and in some ways his seems the most plausible, perhaps because it is the most pessimistic; the three characters all live down to the lowest expectations in their selfish and vile actions. His account begins with Tajomaru trying to persuade the woman to go away with him; otherwise, he says he’ll have to kill her. She wants the men to fight for her, but the husband is disgusted with her and refuses. However, the wife quickly turns her tears into laughter and attacks the men’s pride until they reluctantly begin their combat. Several shots in depth place the woman in between the men, and the shaking tip of their swords meet directly in front of her in the foreground of a couple carefully composed shots. All three of the characters became frightened during the battle, and this blundering sword fight contrasts sharply with the bravery and skill Tajomaru described earlier. It’s interesting that the earlier fight seemed perfectly plausible within the framework of cinematic reality until the woodcutter’s more realistic version makes it seem unlikely. This new struggle is also exciting, however, because of the masterful camerawork that follows their clumsy sparring. After the husband is beaten, he states plainly and truthfully, "I don’t want to die", but the bandit finishes him off in the same manner and location as Tajomaru himself earlier described. This brutality scares the wife off, and the bandit is unable to catch her. One image near the end is a medium-long shot through some branches that seems to suggest the woodcutter’s point of view. Yet his story could also be completely fictional, as if he had merely combined various parts from the previous tales. Perhaps by telling this lie and believing it, he is attempting to resolve his confusion over the issue. The man listening to these stories also doubts this last account, implying without much argument that the woodcutter has taken the valuable dagger and, therefore, has some motivation for lying. This roguish character has probably most clearly stated the film’s theme earlier when he laughs and says, "we all want to forget something…so we create stories. It’s easier that way." He has also stated that people "can’t tell the truth, even to themselves", and the priest somewhat agrees, saying that men are weak and lie to deceive themselves. The idea put forth is that our perceptions allow for no objective truth, only a subjective kind that would be different for each person. The rogue feels that no one can be trusted and thinks this gives him the right to be selfish. Furthermore, he doesn’t seem bothered by this behavior or by all the lying and takes pleasure in seeing the priest’s idealism shattered, laughing maniacally at the end. The priest realizes the negative consequences of this attitude and states that the world becomes a hell when people can no longer rely on each other. But his faith in man is restored when the woodcutter, who has probably been a part of the lying and stealing, nobly offers to care for the abandoned child. Although (and because) man will lie to others and to himself and turn truth into an abstract, meaningless concept, there is much need in the world for compassion and trust. The film suggests that it is admirable and necessary to look for the good in people rather than celebrating their wickedness. Its thematic concerns, stylistic brilliance, and historic value make Rashomon a very important film. The mystery created by the four different stories also makes it an intriguing work that encourages multiple viewings; the rogue says, "I don’t mind a lie, if it’s interesting", a comment that can apply to this film and the whole of fictional cinema.